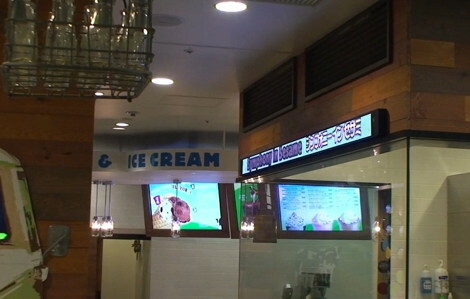 “There’s also a ‘Twitter Ticker’ that allows the store to drive more positive engagement with customers via social media” we wrote recently in our article about Scala powering the digital menu boards and Twitter feed at Ben & Jerry’s new flagship store in Tokyo and it didn’t take long for NanoLumens who manufactured the so-called ‘NanoBar’ used in the install to come up with their own piece of PR around it. Umm, let’s see … “customer interaction to a whole new level”? How so? There’s seemingly nothing new here at all. This was shown, well over two years ago and made up of a single row of horizontal MicroTiles placed above the coffee bar on their stand in Amsterdam. 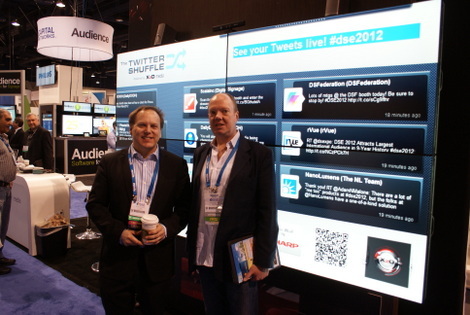 This has so far been shown at a number of places but shown we believe for the first time at #dse2012 this year. We do know that NanoLumens was simply asked to build an 8’ wide, 4.5” tall, full color 6mm pixel pitch LED display BUT without being given any idea on cost we have no way of knowing whether NanoLumens was a particularly good or cost effective way to build such a ‘Twitter Ticker’ over say LCD – what we do know though is that it isn’t particularly inspiring! Having seen the installation ourselves, we’d have to say that the content as a whole is very disappointing – when you get to the stage that a retailer has to include a scrolling ticker feed of twitter to liven things up a bit you should probably realise that something has already gone wrong with your content strategy or retail store design. 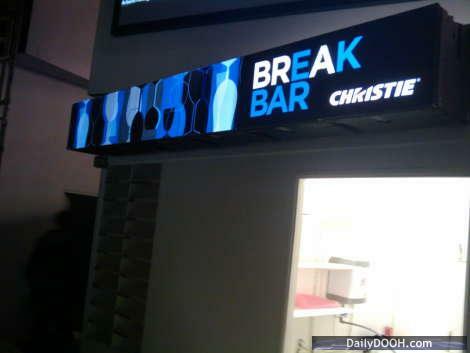 This entry was posted on Friday, June 22nd, 2012 at 07:44 @364 and is filed under DailyDOOH Update. You can follow any responses to this entry through the RSS 2.0 feed. You can leave a response, or trackback from your own site.